Discus Fish Care - Breeding,Feeding,Diseases & More!!! What do Discus fish eat? These species were discovered in 1840, by Dr. Johann Jacob Heckel in the freshwaters of the Amazon and its tributaries. These great looking small fish are known for their flat disc shaped body and they exist in groups, taking cover in underwater plants, where they get indirect sunlight and solitude they need. Because of their flat shape, they make unrestricted movements playing hide and seek in the aquatic vegetation. These fish are found in Amazon stretches of Brazil, Columbia and Peru. 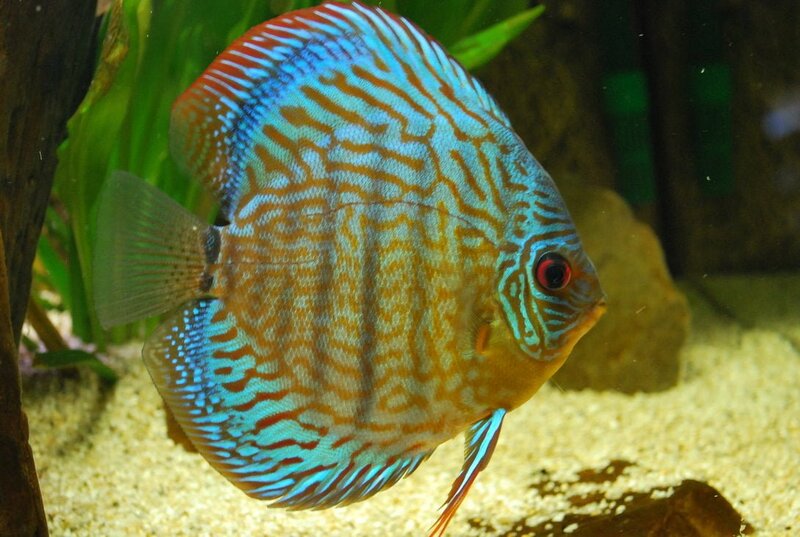 The freshwater Discus can be found in three colors Green, Blue and Brown. Their colored appearance depends upon the geographic location of their natural habitat, which is usually deep and still backwater, where the submerged trees and plants gives a very flourishing place to these pretty fish. The most preferable conditions are offered by gently acidic and warm water areas, since these fish are a bit shy and peaceful, so they prefer to have a secluded territory, where they don’t have to face unwanted enemies and predators. These are average sized fish, with a round and flat body and out-stretched fins making it look like a disk. It is characterized by a small mouth, tiny bright red eyes, vibrant green, blue or brown colors and nine vertical, dark stripes. The pet Discus is available in other colors too, after crossing color varied species. The stripes are a shield for protection and a way of communication within the members of a Discus school. Discus fish are about 2 inches long when they are born and can grow up to 6-8 inches in diameter. They grow at a rate of about half to one inch every two months. Pet Discus fish when given proper care and nutrition, may live for 15 years and it attains diameter of 8 inches at an age of 2 to 2.5 years! These are not an easy pet, since they require certain water conditions that may not be provided in fish tanks by an inexperienced caretaker. The Discus fish as a pet must be handled by those who are passionate enough to learn how to properly breed and care them. These fishes, are usually kept in a planted tank with CO2 injection, to maintain slightly lower pH that is around 6.8. Other options for housing these type of fish are bare bottomed tank, although this may not appeal to many as it is not as aesthetically pleasing as the previous tank. The bare bottomed tank is considered by many, as an easier tank to keep them, since the feces of the fish and other debris can be cleaned easily. If you are planning to breed them, you should get a bare bottomed tank for your fish, so that the fry do not get trapped in the gravel and die subsequently. The Discus fish breed thrives in soft water with low mineral content and pH value between 4.0 and 7.0. The water temperature must be a bit higher than 80 degrees Fahrenheit. Discus fish are a very sensitive breed, which can be highly affected by an unclean aquarium. Proper care must be taken to avoid bio-debris being collected in the aquarium. This debris can be due to the remains of the food offered to the fish, like live worms, beef heart, feed flakes and vegetable shreds. In addition to these, excreta of the fish can also accumulate to create this unwanted biomass. For proper breeding, you must ensure that if some food is not consumed by the fish, it must be immediately removed from the tank with the help of a net, before it deposits at the bottom of the tank and dissolve and disappear in the gravel. If you fail to do this, bacteria, viruses, and other parasites may multiply on the organic matter and make them sick. These can easily reproduce in the aquarium tank, if given the right conditions and attention. The first thing that you must pay attention to, is that the pH level of soft water in the aquarium tank is just right close to 6.5. Discus fish are very fussy about their surroundings, so a small or congested aquarium may discourage them for breeding. So, the tank must be at least 36 inches x 18 inches X 18 inches in dimensions to give an ideal space to them for reproduction. When they are ready to spawn, you must place an upturned clay pot or cone, which is fairly tall for them to lay eggs on. Here the fish will get a secure hatching area where they can lay and guard their eggs. For breeding you need a young and healthy pair of Discus, you can buy a set of young Discus fish and when they grow, they will breed to give you a whole Discus school. You must have 6-10 Discus from different breeders to have genetic diversity to get a good and varied population. You can also get a breeding pair from a reputed breeder and this way you may get the expected results, faster. When you have a breeding Discus to feed, you must provide protein rich and diversifying diet. These fishes are highly territorial when they are in the process of pair bonding and at such times the male displays aggression, to claim right on the female Discus. This way the male gets a female as a mate and prevents another male Discus from the potential mating pair. You must keep an eye on such mating pairs, before the male hurts other males, and this mating pair must be put in separate aquaria. The spawning medium has to be placed in the center of the aquarium and the fish will spawn eggs after cleaning the area around this medium. The pair will mate and the female will lay eggs every week for fifteen weeks. If suitable conditions are given to the mating pair, they will be devoted to each other for the rest of their life and will have more offspring. The Discus eggs are small, slightly opaque spheres, which will stick to the cone. The parent fish pair continuously fan the eggs for ventilation and this keeps them safe from infections. Discus eggs hatch after 48 hours of laying, when the fry will be ready to swim. At this time the young fish feed themselves and grow rapidly. To prevent the fry from becoming aggressive, they must be kept away from the parents and must be fed on commercial food. When they grow up to 2 inches in diameter, they can be sold or gifted to your friends. In their natural homes Discus fish can eat anything they lay their fins on. Basically omnivores, they relish small bloodworms, daphnia, brine shrimp and the underwater vegetation mostly algae. If you are planning to give your pet Discus something really nutritious, then at the time of feeding of Discus fish, it would be good if you combine blood worms and other vegetable shreds like spinach to keep the fish in healthiest shape. Unfortunately, live foods are susceptible to carry bacteria and other harmful parasites, so you should be careful about such diet before you feed your well cared Discus School. Another recommended diet is high grade tropical flakes that would make a good supplement and will give the fish much needed nutrients and vitamins. You can also feed some packed food available commercially, like pellets, which supplement their dietary needs. This will help in developing a strong immune system and a better health. For good health of grown Discus fish, they must be fed with a variety of diet granules. The granule diet will ensure that they get all the nutrients they require. Granules are best processed food for Discus and can be passed through a small conical feeder cone which is greatly relished by Discus. The Discus fish prefer to be fed in the middle of the tank, and may not pay any attention to the food that floats on the water surface or lying near the side walls. Blood worms or beef heart can also be fed in a small feeder cone. If you are feeding Discus fish with beef heart, you have to take extra care to keep the tank clean since the uneaten food will invite bacteria and parasites to grow and that will make the fish sick. To protect them from infections and diseases, you must plan and do regular maintenance in order to avoid polluting the tank. After this Discus will be the easiest fish to keep in your tank. These fishes can go a couple of weeks without eating, but you will need to feed them up to three times a day to help them grow to their full size and acquire their symbolic bright colors. All fish are prone to disease. A well maintained aquarium will never be a hub of diseases. Most of the diseases will come from a poorly maintained aquarium. Any harmful environment is bound to affect your aquatic pets at the end of the day. Clear water doesn’t mean that these fishes are free from Diseases. Most of the diseases can be treated by changing water regularly and keeping the tank clean from biomass. Some of the common medicines like octozin and Interpet Number Nine anti-internal bacteria can also be applied. If the fish are de-wormed frequently, since they are not in their natural habitat, they will remain free from many of the mentioned diseases. If you observe the them closely, they are not competing for mates, they are exceptionally social fish. Their social behavior can be seen by the fact that they prefer to stay in large groups when they are in freshwater rivers. But when they have grown into adults and are seeking for breeding partners they can be very ferocious. At this time males can bully other males to the extent of driving them away to win over their partner. This is a very relevant piece of information if you are a breeder, so that you may keep a number of same age to maintain the equality among companions. This will keep them happy as they will be in their social circle. Since these fish are territorial and if they have young fish in their tank, they can bully them and starve them to death, by stealing their food. When you keep a pet, you research various sources for giving them a loving name. So selecting a Name for your Discus Fish is an important part of fish care. After this exercise, you will be able to identify them individually. You will take better care of these aquatic pets, which are as adorable as any other pet you own. It will create an emotional bonding between you and your special or loved fish. To help you in this important decision we have a complete list of fish names. If you are planning to get only a few of them, it may be possible that they will feel bored or disoriented. So to provide them some friends, belonging to other species of animals, you choose a Tank Mates for your Discus Fish, is a quite difficult but an interesting task. So, some of the companionable partners for your Discus Fish can be Cardinal Tetras, Corydoras Catfish, Ancistrus, Bettas, Angel fish, Guppies, Barbs & Loaches. Know More. If you are investing so much of your resources and are fully committed to get complements for you fish filled aquatic tank, then the most important activity will be, keeping the aquarium clean and cycling water weekly. Purchasing your pet is an emotional and exciting decision, to be taken with great care and after extensive research. You may feel stressed while selecting the healthiest and prettiest fish by spending the money within your constraints. You must not rush to get the first batch of Discus you are offered by any vendor, you must look for a reputed breeder or a reliable retailer, who have a good experience in handling this exotic breed of fish. These sources can be a pet shop in your neighborhood, a hobbyist breeder or an online seller. It is advised that before getting your batch of Discus, you must spend some time in observing them for their vibrant colors, their interaction with other fish, how active they are and that they look generally content and happy. As far as physical examination is concerned, the fish must not breathe heavily, have twisted mouths, ill shaped fins and tails, skin injuries, swollen eyes and insufficient gill covers, which are a clear indication of their ill health and incapable breeding. You can throw a few bits of feed to see if they rush to capture the food, this will show their agility. They should eat the food slowly, which is an indication of good health. You must ask the vendor about the age of the fish, water conditions needed in aquarium and Discus background to check his knowledge and expertise, so that you get the best bargain. Shipping of Discus is also an important factor, it must be transported in a proper wish bowl that is strong and reliable to bear the discomfort of travel.